Just ten miles east of Rogers, Arkansas, on State Highway 12, is Hobbs State Park – Conservation Area. At 12,056 acres, it is the largest land-holding state park in Arkansas. Long ridges, steep hollows, wild life and wildflowers, unique geology and unique history – it’s all here, only minutes away from the cities of Northwest Arkansas. Often called simply “Hobbs”, the park recalls the spirit of early Arkansas settlers. It provides a glimpse of much of the beauty that lured them to the Ozarks and the natural resources that inspired them to stay. It is from Hobbs' valuable and unique resources that the park's mission is derived, which is, "To provide enriching educational and recreational experiences in harmony with resource stewardship." Balancing the ever-increasing need for recreation while protecting the ecosystem and educating Hobbs' visitors about the park and its history is an exciting challenge. Arkansas's largest state park in land area, Hobbs State Park-Conservation Area (HSPCA) covers a 12,056-acre tract of diverse Ozark landscape along the southern shore of 28,370-acre Beaver Lake. Twenty-two of the park’s 60 miles of border stretch along the shores of Beaver Lake. The park lies between Beaver Lake to the north and War Eagle Creek to the south with acreage stretching across a part of Benton County southeast of Beaver Lake and extending into Madison and Carroll counties. This park's landscape consists of plateaus, ridges, valleys, and streams featuring an upland forest of oak, hickory and pine. Many water features including disappearing streams, springs and seeps have carved the many hollows in this fragile limestone landscape and created cave-related features including numerous sinkholes. HSPCA is managed jointly by Arkansas State Parks, the Arkansas Natural Heritage Commission, and the Arkansas Game and Fish Commission. The park is 10 miles east of Rogers on Ark. 12, which bisects the park property. The park's 17,531-square-foot visitor center opened in May 2009. 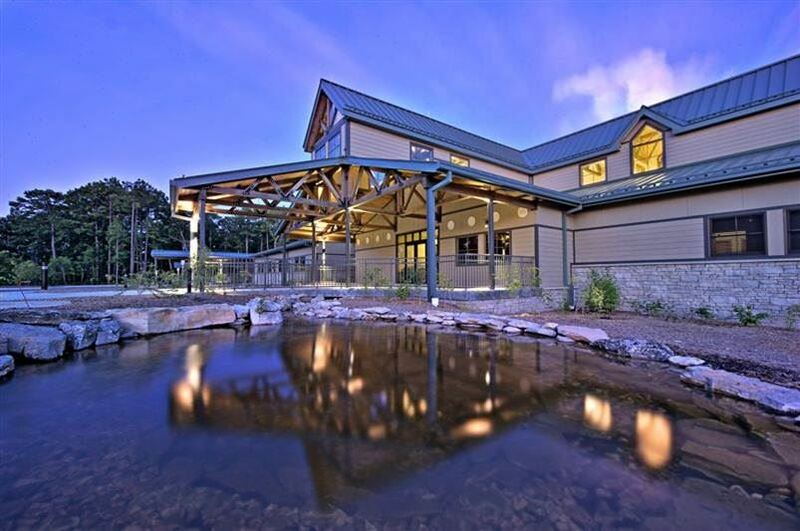 This state-of-the-art facility features Ozark focused exhibits including interactive kiosks, classroom space, a retail sales area, and the park's administrative offices. Wi-Fi wireless Internet access is available here. The visitor center is on Ark. 12 near the junction with War Eagle Road. More about the Visitor Center HERE. Park interpreters offer a wide diversity of programs and workshops throughout the year. Read more about the interpretive program and view the schedule HERE. The Hobbs trails include something for everyone. Spanning a difficulty range from handicap accessible to challenging, you can enjoy the beauty of the Ozarks no matter what your ability level. All trails are open to hiking and some are open to biking and horseback riding. However you traverse them, you will enjoy the calm, quiet beauty of the wooded hills and find yourself breathing a little deeper as you take it all in. 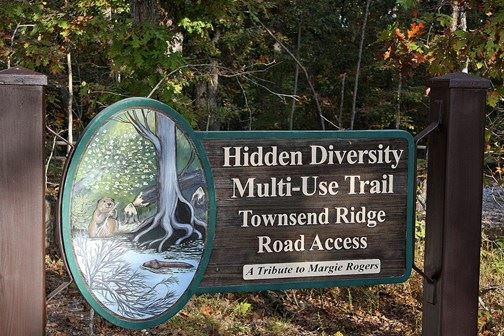 For more information on the Hobbs system of trails visit the Trails page HERE. The park includes the only public, outdoor shooting range in Arkansas with a bullet trap (open Tuesday through Sunday). NOTE: The shooting range is closed every Monday throughout the year for maintenance and repair. In addition, the park offers regulated seasonal hunting; undeveloped access to 28,370-acre Beaver Lake; and interpretive programs. HSPCA is Arkansas's only state park where hunting is allowed. Future development and expanded visitor programs at the HSPCA will include cabins, pavilions, picnic areas, additional hiking trails, and archery and orienteering courses. More on the Shooting Range HERE. NOTE: Campsites on Beaver Lake are managed by the U.S. Army Corps of Engineers. Call 877-444-6777 or visit http://www.ReserveUsa.com to make reservations. Trails and campsites are open all year, however PLEASE NOTE: The Hidden Diversity - MultiiUse Trail, Pigeon Roost Trail, Shaddox Hollow Trail, and Sinking Stream Trail will be closed during permitted hunting seasons. This includes fall gun and muzzle loading deer seasons, and fall youth gun deer season. Restroom facilities are open all year, but provide no heat or water.